You spent hundreds, perhaps thousands of dollars on your big-screen TV, and every evening it forms the center of your home entertainment system. So shouldn't you give it the best picture you can? If you're watching broadcast TV through a cable or satellite connection, you can do better. 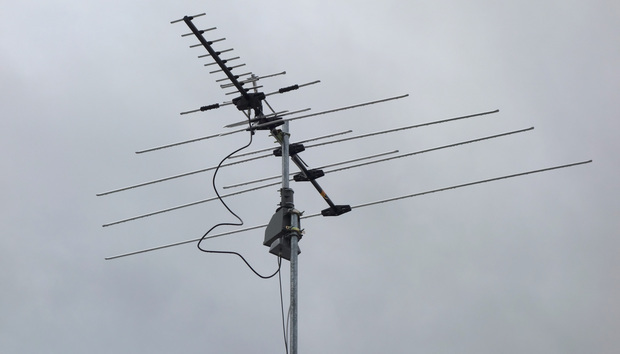 A TV antenna will give you a signal that's superior and, best of all, it's free. It all comes down to the way digital programming is sent to your TV. Inside a TV station, video data might be flowing at hundreds of megabits per second, but a standard U.S. broadcast channel can only carry about 20Mbps. And depending on the channel, that's split up between the main channel and sub channels. The ATSC TV standard used in North America uses MPEG-2 compression to compress the data, so it can be transmitted over the air. When it's decompressed by your TV, it should look identical to the original. But no compression system is perfect, so there's always some picture degradation. You'll notice it as noise if you take a close look at detailed areas of the picture on your TV screen. Because cable and satellite companies carry so many channels, they often use more aggressive compression than over-the-air stations, and that leads to greater noise. Cable and satellite signals also go through more processing, and that also impacts the picture quality. Here's an example from a pro football game broadcast on NBC. The Oakland Raiders logo displays on a broadcast (left) and cable TV feed. The image on the left is from a TV antenna while the image on the right is from cable, both viewed on the same television. Look closely at the detail in the Oakland Raiders logo (click the image to enlarge it) and the word "Raiders" above the logo. You'll see much of it is lost in the cable image. The same is true of the Miami Dolphins logo. The Miami Dolphins logo displays on a broadcast (left) and cable TV feed. In the cable TV image, the dolphin's eye is difficult to make out, but it's clear in the broadcast image. Football game captioning on a broadcast (left) and cable TV feed. It's not only in football games where you'll see a difference. Pictures from an antenna will appear sharper and more detailed in general, but you'll probably appreciate the difference more when watching live sports or movies. So, as the Olympics and Super Bowl approach, consider a TV antenna a worthwhile upgrade to your entertainment system. As a bonus, it will guard against those times when the cable goes out, such as February 2017 when Comcast service went down in the D.C. area, causing thousands to miss most of The Super Bowl.